This is my version of a recipe I found in the NYTimes in 2004. It’s in the German potato salad style, with an oil/fat solution added to the hot, drained potatoes (and no mayo). 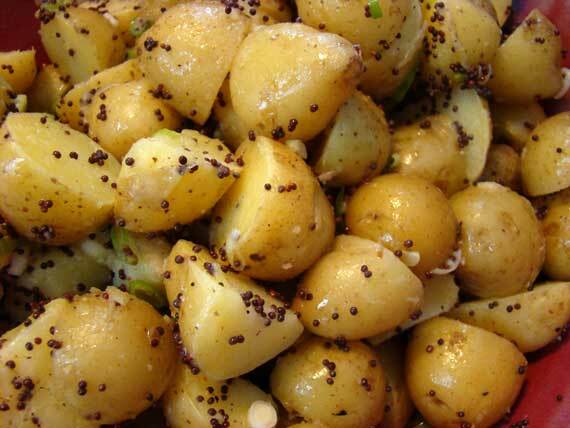 Use small or new potatoes if you can, and pick potatoes that are approximately the same size to facilitate cooking…. Put washed potatoes into a deep cookpot. Add water to cover and salt (maybe 1–2 tsp, if you are not on a salt-restricted diet). Bring to a boil and turn down to a simmer. Cook time will depend on potato size. Smaller potatoes may take only 10 minutes. If a fork goes in all the way to the center with ease, the potatoes are cooked. Avoid overcooking. While the potato water is coming to a boil…take a non-stick pan and cook the chopped bacon down to render the fat. Remove the crispy bacon bits and set aside. Add mustard seeds to hot bacon fat. Turn the heat back on if necessary to get them to begin to “pop” in the heat. Turn off heat. Add garlic to cooling pan so they flavor the bacon fat (remove or not, your choice). Add sliced onions, too. Alternatively, reserve green onions in bowl with cooked bacon (the photo shows the salad prior to addition of these goodies). Add vinegar and stir. Add some fresh-ground pepper to warm mixture. You can remove some of the bacon fat and substitute another oil, or add more oil if the amount rendered is insufficient for the amount of potatoes you have. Drain cooked potatoes. Carefully slice into chunks if they’re larger. Small potatoes can just be halved. Put into serving bowl. Add warm liquid mixture from bacon pan, and salt and fresh-ground pepper to taste. Stir so mixture is homogeneous. Set aside to cool to room temperature, perhaps an hour. Add onion/bacon mixture and stir one last time. Wonderful.